Your course site must be published before students can access it. You can determine quickly if your course site is not accessible to your students as it will say “Unpublished Site” on the left menu, right above Home. Keep in mind that publishing your site does not mean that students will be able to log on. Your roster must be uploaded into your site before students can access it. You can verify if your roster is in by looking at Activity Meter or Roster. If your roster is loaded and your site is published, students can log in. Most institutions load student accounts into Etudes on Friday before classes start. 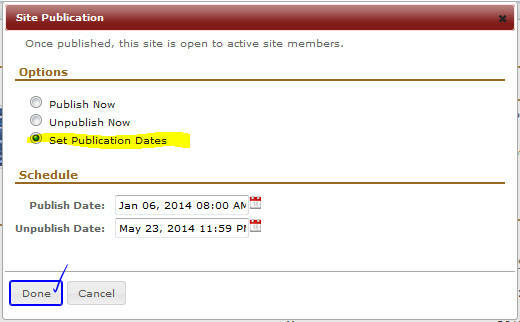 Please contact your Distance Education office to find out when they plan to load rosters to next term’s course sites. 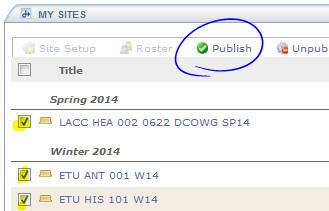 You can publish and unpublish your course site manually or automatically. Click on Edit to the right of Publish. Click on Publish site now to enable access to your site immediately. The Unpublish option disables access to your site by students and guests. This is most valuable when you are preparing a site, prior to the start of terms, and again, when a term is over (after final exams). Click on Done. You will see a green check and the word Published. The unpublished label will be gone from above Home, and your students will be able to access your site. 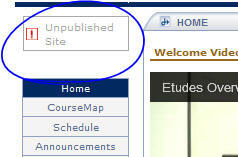 To let Etudes enable and disable access to your course site automatically, go to Site Setup, click on Edit by Publish, set your publish and unpublish dates and click on “Done”. Etudes will open and close your site on the dates you set. Most instructors open their sites at 8:00am on the first day of the terms, and unpublish them after finals are over. Note: Scheduled publish and unpublish jobs are processed by Etudes every 10 minutes, so despite the time of your scheduled events, there may be a short delay before they are posted. Check the boxes of the sites to select them. Note: Instructors and Teaching Assistants access unpublished sites. Students and guests cannot.